Holmes, Jeffrey. 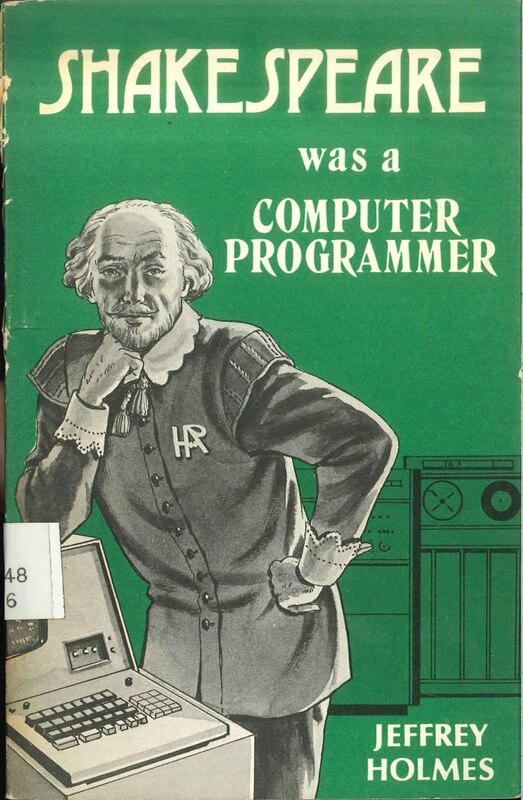 Shakespeare was a Computer Programmer. Fredericton, New Brunswick, Canada: Brunswick Press, 1975. And sometimes we run across items that are "even more bizarre and inexplicable," to quote Douglas Adams. Shakespeare was a Computer Programmer is an extremely odd little book. I spotted it scroll by on the Folger Library Twitter Feed and thought I'd track down a copy myself to see what it's all about. I thought it was probably a book to help computer programmers understand Shakespeare or to help Shakespeareans understand computer programmers better. Instead, I got something of a parody of the authorship debates. Our purported author—Professor ----------, according to Jeffrey Holmes—discovered a number of odd bits of old paper. To his astonishment, they lead him to the conclusion that the plays of Shakespeare were really written by "one Harry Ramsbottom, an illegitimate Yorkshireman, using technique not to be dreamed of until the advent, four hundred years later, of computer programming" (7). As near as I can figure, the rest of the book imagines that specific words and phrases in Shakespeare were given codes that would make them interchangeable. With a list of intriguing and well-written words and phrases, each given a code, a play could be compiled much as computer code would be. And it goes on from there, giving examples of lines that could have appeared in one play but actually appeared in another. There you are. It's odd, but I did read it, and I thought it needed a write-up.